Cazorla is a great Spanish town. Full of character and atmosphere, the history of Andalucian Spain cascades from every high fortress wall like the crystal waters stream from the towering cliffs. We’ve visited Cazorla many times while wandering southern spain, and every time the town reveals a fresh perspective on the “real Spain”. Today routes was up and over the great limestone walls above Cazorla into the forested valley of the Rio Quadalquivir; following the “Great River” to Hornos and then the sweet climb to Santiago de Esapada and on to Puebla de Don Fadrique, the last town in Andalucia on the border of Murcia. Some 150km and 3000m of ascent. 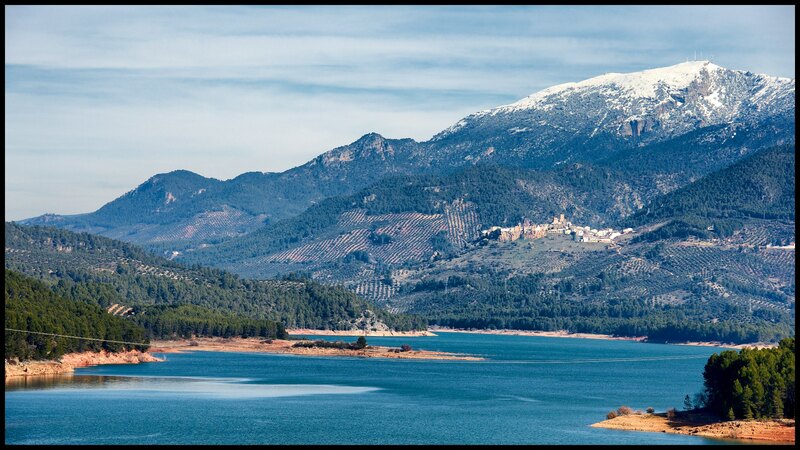 The route starts with a climb out through La Iruela over to Arroyo Frio, giving panoramic views of the river valley to the east and hundreds of miles of olive groves to the west. Convocations of Booted Eagles soar on the thermals rising from the valley floor, searching for any scurrying mammals brave enough to face the sniper vision of these elegant birds of prey. The road descends for nearly 40k, a great road, only blighted by the relatively heavy traffic from tourists and “domingeros”. Its wisest to try and avoid weekends when riding this route. A huddle of great little cafés and bars overlook the El Tranco dam wall that forms the lake and this is a great place to have a quick rest and a coke! The climbing starts very soon after here. Hornos is perched on a hill with its fortress church guarding the pass over the mountain ridge. From here the old road takes you north over the ridge, but the main purpose of this route is to climb the new road from Hornos to Pontones. This road was recently converted from an old gravel camino to perfect asphalt. It doesn’t appear on many older maps, but new maps show the road as a “scenic” route. Wide sweeping switchbacks and steep prolonged climbing with some of the best views in Spain. This is much more than scenic, this is road riding at its best. Solid climbing of almost a 1000 metres, over 20km, then a false top at Pontones and a further 10km of climbing to the summit over looking Santiago de Espada. The sustained climb rewards the toil with ever impressive views with every metre won. Only a single short respite is offered before the summit and the descent to Pontones. Once the high plains of the Sierras de Segura have been reached the fertile soils of the Espada valley await, with another ascent to Puerta del Pinar. A high point of 1600m. From here a short exhilarating descent brings the route to its final destination and well deserved Ceraveza in Puebla de Don Fadrique. A route that is surely one of Andalucias best kept secrets.